"“Hollywood is a place where they’ll pay you a thousand dollars for a kiss and fifty cents for your soul." The Hollywood Roosevelt is considered by many to be one of the most haunted places in California. This particular establishment was officially opened on the 15th day of May in the year of 1927. The name of the hotel was established out of respect for the famous Theodore Roosevelt, who was the 26th person to become President of the United States. Despite the fact that Roosevelt had passed away just eight years prior to the opening of the hotel, most people in America respected his energetic personality, ideas, and the work that he did during his lifetime. Since Hollywood is most often associated with the “American Dream”, it seemed only right to name this grand structure after him. Here, you will learn about the ghosts that are believed to be in this haunted Hollywood hotel. The Hollywood Roosevelt Hotel quickly became popular among those in the entertainment industry. The hotel provided guests with an assortment of amenities during their stay and worked to ensure that they catered to those that worked in the area. The construction of this respected hotel ranked in at just over two and a half million dollars. The structure was an amazing twelve stories and came complete with three hundred rooms – this included many fancy suites that many Hollywood names found highly appealing when it came to lodging. The inside is not the only thing that is appealing. The outside of the structure exhibits style and class through its Spanish architecture. In the year of 1929, the entertainment industry’s “Academy Awards” was held for the very first time in a ballroom of the structure that was identified at the time as “Blossom”. Several people won awards at this event. Among these individuals were Janet Gaynor, Lewis Milestone, Charles Chaplin, and Emil Jannings. This event allowed the Hollywood Roosevelt Hotel to gain quite a reputation among actors, actresses, directors, and cinematography professionals in the entertainment industry. Quickly, many famous personalities took an interest in visiting this immense and widely popular structure. It seems, several decades later, that many of these famous personalities are just as attached to the Hollywood hotel in death as they were in life. One example of the famous personalities that grew attached to the Roosevelt Hotel was Marilyn Monroe. Today, many visitors, hotel employees, and paranormal investigators believe that the ghost of Marilyn Monroe still lingers in the establishment. It is her spirit that leads many to believe that this is one of the most haunted places in California. Marilyn Monroe spent most of her childhood and teenage years moving from one foster home to another, but then set out for Hollywood to pursue a modeling career as a young adult. 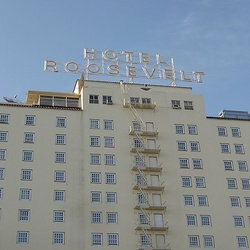 When she got to the area, she elected to live at the Roosevelt Hotel while she engaged in photo shoots and rose to fame. Records indicate that she called the hotel home for at least a couple of years. She stayed in the suite that is identified by the number “246”. 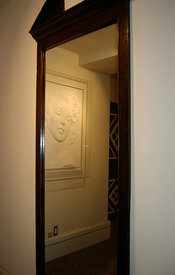 Individuals such as guests and employees claim that the spirit of Marilyn Monroe still resides in the room identified as “246”. This room is one that allowed Marilyn to overlook the pool that was located at the hotel during her stay. She often spent quite a bit of time in and around the pool. As a matter of fact, her first official modeling shoot took place at the pool. Within her room, there was a full length mirror. Obviously, she spent quite a bit of time looking into this mirror – ensuring that her image was in order for her professional pursuits. Rumor has it that many have witnessed her face as well as a full body apparition within the mirror. This special mirror has since been removed from this particular room, but it is still considered to be one of the most popular components of this haunted hotel. If you are interested in haunted places in California and would like to see Marilyn Monroe, the Roosevelt Hotel is the place to be! This hotel is not considered to be one of the most haunted places in California simply because of the fact that the spirit of Marilyn Monroe can be found there. There are other spirits as well. Perhaps one of the most popular is that of Montgomery Clift. This popular actor played in productions on film as well as on stage. During his professional career, he was nominated a total of four nominations for the special awards known as the “Academy Awards”. While creating the film called “From Here to Eternity” which was released in the year of 1953, he stayed at the Hollywood Roosevelt Hotel for at least three months. He stayed in the room identified as “928”. Today, many claim that his ghost remains in this room and often moves around on the 8th floor. Many even claim that his spirit plays a bugle. If you are interested in haunted places in California, you are sure to love the spirits that haunt the Hollywood Roosevelt Hotel.